Travis Kauffman, 31, stepped on the cougar's neck to asphyxiate it, he said. The Colorado man who was attacked by a young mountain lion while he was trail running described the harrowing fight for survival that led him to kill the large cat. 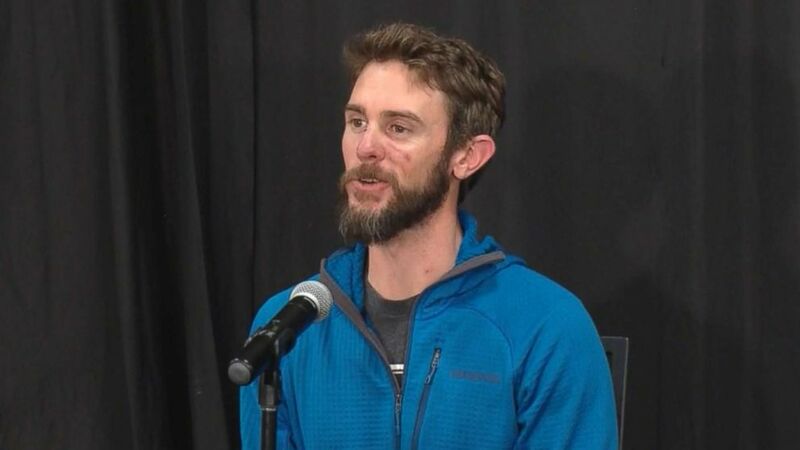 Travis Kauffman, 31, was running on Horsetooth Mountain in Larimer County, Colorado, around noon on Feb. 4 when he was attacked by a juvenile mountain lion that may not have learned yet that humans are not prey, the lucky victim told reporters during a press conference Thursday afternoon. Kauffman, who appeared at the news conference with scars on his face and neck, had set out for a 12 to 15-mile run that day, he said. After he got to the top of the mountain, icy conditions on the West Ridge Trail caused him to turn back and take a separate route, he said. 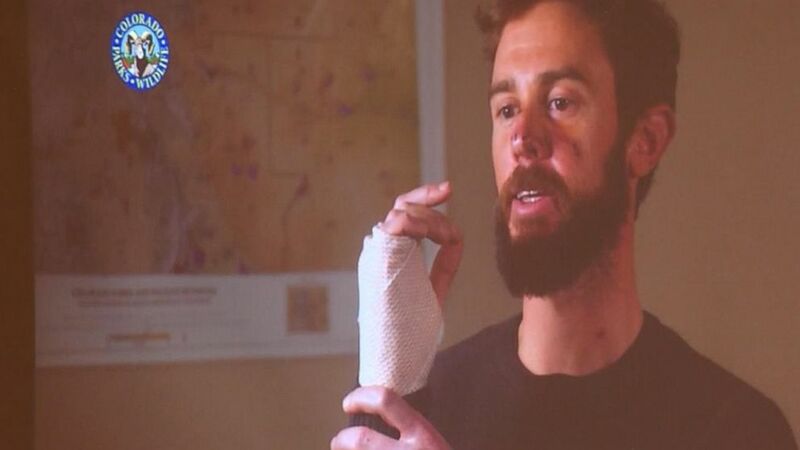 (ABC News) Travis Kauffman, the main who fought off a mountain lion, speaks to the press about the attack in Fort Collins, Colo., Feb. 14, 2019. About a quarter mile into that trail, he heard pine needles rustle and a stick break behind him, and even though he assumed it was a deer or rabbit or other woodland creature, he instinctively turned his head to find a mountain lion about 10 feet away zeroing in on him. "One of my worst fears was confirmed," he said, adding that his heart sank to his stomach. Kauffman then did everything he was supposed to, officials said. He threw his hands up and started yelling, but that didn't stop the large cat from lunging toward him, he said. The mountain lion latched onto Kauffman's wrist and began clawing at his face and leg and he screamed "the whole time" with his best "barbarian yell," he said. (Jerry Neal/Colorado Parks and Wildlife) Travis Kauffman, 31, shows where a mountain lion latched onto his wrist when he was attacked while trail running, Feb. 4, 2019, on Horsetooth Mountain in Colorado. As he tried to throw the mountain lion off him, it re-gripped his wrist, and the fight turned into a wresting match, Kauffman said. The mountain lion thrashed as it continued to hold onto Kauffman's wrist, and he was able to get the cat on its back while well aware that its hind claws could have done serious damage to his groin, pinning them with his leg, he said. Kauffman grabbed at anything he could as he pinned the lion down with one wrist -- first sticks, which broke at he hit the animal because they were rotten, then a large rock, but he couldn't get much leverage due to the immobility of his other arm, he said. After Kauffman transitioned his body weight, he was able to step on the cat's neck, holding his right foot there until he felt it release his wrist, he said. With the help of adrenaline, Kauffman then ran about 3 miles down the trail before encountering another runner, who accompanied him through the remaining journey, he said. The whole way down, Kauffman was nervous that a fully grown mother mountain lion would come after him next, and the pair then ran into a couple, who drove him to the hospital, he said. 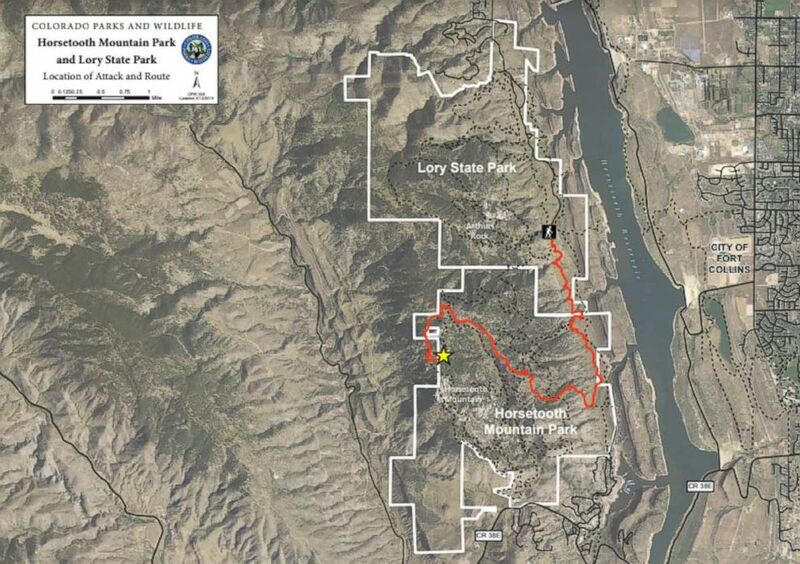 (Colorado Parks and Wildlife) A map of the Horsetooth Mountain Park and Lory State Park shows the path of hiker Travis Kauffman and the location of where he was attacked by a mountain lion. Wildlife officials received a report around 3 p.m. that day that the mountain lion had attacked a runner, said Lauren Truitt, spokeswoman for Colorado Parks and Wildlife. Truitt described the injuries that Kauffman sustained as "serious but non-life threatening." He sustained 17 stitches along his cheek and another six on his nose, he said. Other than that, the lion merely left puncture wounds on his body, he said. Mark Leslie, northeast region manager for Colorado Parks and Wildlife, told reporters that Kauffman wasn't even sure the mountain lion was dead when he ran away from the scene of the attack. The necropsy confirmed the details of Kauffman's account and determined that the lion did not have rabies, Leslie said. 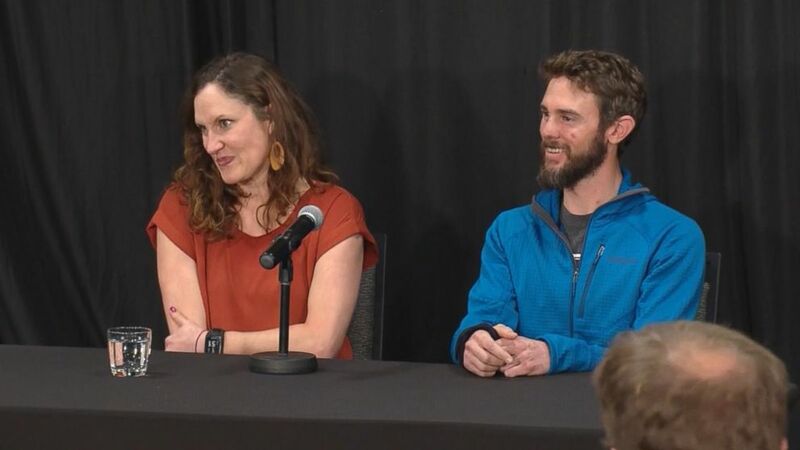 Leslie described Kauffman's story as "an incredible survival," calling it fortunate that it was a young mountain lion that attacked an experienced trail runner, otherwise the attack would have resulted in "a different story." 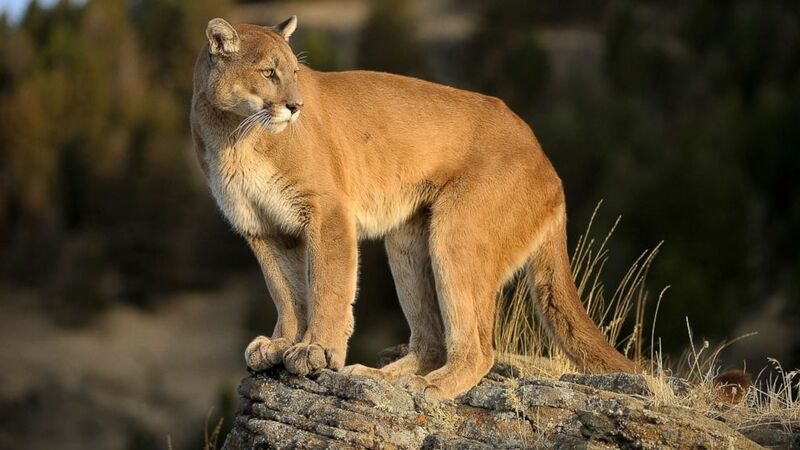 Mountain lion attacks are not common in Colorado but the lion's hunting instincts were triggered by the runner, Ty Petersburg, area wildlife manager for Colorado Parks and Wildlife, said in a statement last week. The large cats, which are sometimes called cougars, tend to be quiet, solitary, elusive predators that typically avoid humans. They are "extremely powerful" and ambush their prey, Leslie said. Fewer than 20 people have died from cougar attacks in North America in more than a century, and there have been less than 20 mountain lion-related injuries in Colorado since 1990, according to a press release from Colorado Parks and Wildlife. The trail runner said the thing he remembers most about the attack is the "silence of it" and the sight of the lion's lethal weapons. "I remember looking down and seeing the claws retracting and coming out of its paws," he said. "It was, really, pretty visually intense." About a week and a half after the near-deadly encounter, Kauffman feels "great," he said. Kauffman, who is passionate about living an outdoor lifestyle that also includes mountain biking and skiing, said he doesn't plan on ending his trail running hobby. He recommended that others run without ear buds so they can "fully appreciate the sights and sounds of nature," and, more importantly, be aware of any potential threats. He also advised trail runners to try to run with a buddy. "That's something that I will be doing going forward," he said. Kauffman, who stands at about 5-foot-10 and weighs about 155 pounds, joked that others would be disappointed that he was on the scrawny side for someone who had just killed a powerful animal. Now, he gets to spend Valentine's Day with his girlfriend, Annie Bierbower, who appeared alongside him at the press conference, he said.